Western Business Events (WBE), host of The Fire Safety Event, is pleased to release further developments on this year’s exciting seminar programme. Now in it’s third year The Fire Safety Event features a powerful combination of education, networking and business support designed to help organisations maintain the very highest standards of fire safety management. Curated and delivered in partnership with Fire & Security Matters magazine, The Fire Safety Event free seminar programme will cover and challenge critical topics in fire safety management today. Across two theatres, content will feature a mix of case study presentations, white paper presentations, thought-provoking debates and legal updates all presented by government officials, lawyers and leading industry professionals. The Fire Safety Event are excited to welcome high profile speakers at this year’s event including former Chair of the UK Health and Safety Executive, Dame Judith Hackitt and Sal Cassano, a decorated firefighter who has gained worldwide recognition for his development of NYFD after the 9/11 attacks. In the wake of the Grenfell Tower Fire disaster, Dame Judith Hackitt will explore her independent review of Building Regulation and Fire Safety as well as provide an overview of key recommendations direct from the Government following this review. Alongside Desmond Burke of Firetronics, former Fire Commissioner Sal will discuss the enhanced fire protection, stringent fire safety training and building inspections which were implemented following the 9/11 disaster. Co-speaker Desmond Burke has acted as chair to the New York Building and Managers Association. Together the pair will review the effectiveness of good code enforcement programmes, how to develop the safest buildings, offer practical solutions to evacuate occupants during fire, bomb or chemical release attacks as well as exploring how New York rebuilt in the wake of 9/11. Many of the events exhibitors will also be hosting dynamic, specialist demonstrations and seminars. On 11th April 12.00-13.00 the audience will act as both judge and jury whilst Pinsent Mason conduct a live, engaging and dynamic mock trial based on a real-life prosecution under the Regulatory Reform (Fire Safety) Order 2005. Hosted by Advanced’s Neil Parker ‘Thinking compliance: Fire solutions for greater peace of mind’ will help visitors to understand their legal responsibilities, ensuring fire detection systems are not only reliable but compliant with the law. 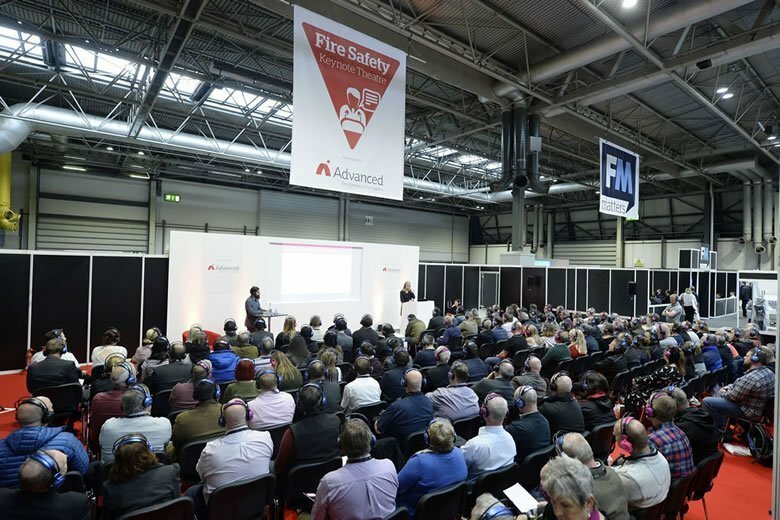 As well as this and sponsoring the events Keynote Theatre, Advanced will be hosting regular live demonstrations on how to ensure your fire alarms are reliable. Following the spotlight placed on industry after the major Dubai skyscraper fires and the Grenfell Tower tragedy – Kingspan’s Tony Ryan aims to focus on reducing the risk of fires in cladding systems in the UK. ‘Fire safety of insulated panels and façade systems’ will provide insight into how to ensure safe cladding systems are selected. Alongside this, Kingspan will also be demonstrating live burn tests on panels, helping show visitors first-hand the suitability and robustness of their cladding systems. Further addressing the challenges covered in Kingspan’s presentation, the Association for Specialist Fire Protection (ASFP) will be hosting a Tall building fire protection area at the Fire Safety Event, focusing on this highly contemporary issue that has drawn media attention in recent years. Bringing together expert speakers from across the industry, sessions will consider tall building fire safety, Common tall building fire safety concerns and Ensuring competency of installers. Speakers will discuss training and qualifications and best practice for compartmentation and the correct installation and maintenance of firestopping and fire doors. Co-located events at the NEC have on offer a range of seminars that are especially relevant to a fire safety audience, including “Digital Voice: the next step in the UK’s digital transformation and how alarm signalling will be affected”, taking place on 10th April at The Security Event. Alongside a host of engaging speakers and demonstrations, visitors to The Fire Safety Event will be able to see the latest products and receive hands-on advice from 40+ major fire safety brands exhibiting. Co-located with The Security Event, The Health & Safety Event and The Facilities Event, this year’s exhibition is a must-attend for anyone who has a focus on improving life safety, business continuity and business protection for their organisation.